NFL owners voted to award Super Bowl XXII to San Diego on May 24, 1984 during their May 23–25, 1984 meetings in Washington, D.C. This was the first Super Bowl played at Jack Murphy Stadium (now currently known as SDCCU Stadium) in San Diego, California. Fourteen cities were part of the bidding process, which was scheduled to award four Super Bowls (XXI, XXII, XXIII, and XXIV). The bidding cities included: Anaheim, Detroit, Houston, Jacksonville, Miami, Minneapolis, New Orleans, Pasadena, Philadelphia, San Francisco, San Diego, Seattle, Tampa, and Tempe. The Philadelphia host committee assembled what was considered a strong, but long-shot bid, hoping to win the first outdoor Super Bowl in a cold weather city. Jacksonville and Tempe had no NFL team at the time; the Jacksonville Jaguars were founded in 1993 and did not start play until 1995, while the Cardinals moved from St. Louis to Tempe in 1988. The primary storyline surrounding Super Bowl XXII was that Washington's Doug Williams was the first African-American quarterback ever to start in a NFL league championship game, let alone a Super Bowl. This was even more meaningful given that the Redskins had once been among the league's most racist teams, being the last team to sign a black player after they reentered the league. Redskins cornerback Barry Wilburn was a key player in Washington's defensive unit, who snagged two interceptions during Super Bowl XXII. Williams had played extremely well in his five regular season games, passing for 1,156 yards, 11 touchdowns and five interceptions. The Redskins' main receiving threat was wide receiver Gary Clark, who caught 56 passes for 1,066 yards, an average of 19 yards per catch. Wide receivers Ricky Sanders and Art Monk were also deep threats, combining for 80 receptions and 1,130 yards. Running back George Rogers was Washington's leading rusher with 613 yards. However, Rogers saw limited action in Super Bowl XXII due to injuries that later forced him into early retirement. Rookie running back Timmy Smith started in his place. Fullback Kelvin Bryant also was a big contributor, rushing for 406 yards, and catching 43 passes for 490 yards during the 1987 season. The Broncos finished the strike-shortened 1987 season winning the AFC West with a 10–4–1 record and the number one seed in the AFC playoffs. Dan Reeves was the head coach. The Broncos routed the Houston Oilers in the Divisional round of the playoffs, 34–10, jumping to a 14–0 first-quarter lead off of two quick Oilers turnovers, with Elway completing 14 of 25 passes for 259 yards and two touchdowns in the game. Vance Johnson recorded four catches for 105 yards, including a 55-yard reception to set up Elway's second touchdown pass. However, Johnson was injured during the game; he ended up missing AFC Championship game, and played only sparingly in the Super Bowl. Denver then won the AFC Championship Game in exciting fashion over the AFC Central champion Cleveland Browns, 38–33 for the second consecutive year. The Broncos seemed to be in control of the game during the first half, taking a 21–3 lead. However, with quarterback Bernie Kosar, Cleveland rallied back and tied the score 31–31 in the fourth quarter. Elway responded with a 20-yard touchdown pass to Sammy Winder, taking the lead back with less than five minutes left in regulation. The Browns took the ball back and drove to the Denver 8-yard line, but the drive ended with a play that became known as The Fumble, resulting in more bad luck in Cleveland professional sports lore: Denver defensive back Jeremiah Castille stripped the football from Browns running back Earnest Byner and recovered the ensuing fumble as Byner was rushing in for the potential tying touchdown, securing the Broncos' win. Before the game, it was announced that Williams underwent emergency root canal treatment for an abscessed lower right molar the previous night. Team dentist Barry Rudolph said there were no complications, and Williams then was pronounced fit to start. The game was broadcast in the United States by ABC with play-by-play announcer Al Michaels and color commentators Frank Gifford and Dan Dierdorf. Keith Jackson hosted the pregame, halftime, and postgame coverage for ABC, joined by analysts Lynn Swann and Mike Adamle as well as then Cleveland Browns head coach Marty Schottenheimer and then Minnesota Vikings head coach Jerry Burns. (Bob Griese was originally supposed to co-host with Jackson, but had to bow out due to a family illness.) Also helping with ABC's coverage were Jack Whitaker, Jim Hill and Becky Dixon. This was the first Super Bowl broadcast on ABC with the broadcast team of Michaels, Gifford, and Dierdorf in the booth (as the 1987 season was the first year the trio was together, with Dierdorf moving to ABC from CBS; Gifford was the only holdover from ABC's Super Bowl XIX telecast). The trio went on to man the booth for ABC's Monday Night Football from 1987 to 1997 and called Super Bowls XXV and XXIX. It was simulcast in Canada on CTV and in the United Kingdom on Channel 4. It was also the first Super Bowl in which Mexico's Televisa brought a team of its own (instead of relying on the U.S. signal with comments made from Mexico City), airing on its Canal de las Estrellas. The game was broadcast nationally on radio by CBS, with Jack Buck handling the play-by-play duties and color commentator Hank Stram in the broadcast booth, and Jim Hunter reporting from the sidelines. Brent Musburger anchored the Super Bowl XXII pregame, halftime, and postgame coverage with analysis from Will McDonough and Jimmy Snyder for CBS. Locally, Super Bowl XXII was broadcast on WMAL-AM in Washington, D.C. by Frank Herzog, Sam Huff and Sonny Jurgenson, and on KOA-AM in Denver, Colorado by Bob Martin and Larry Zimmer. Locally, Super Bowl XXII was shown on WJLA-TV, the Washington, D.C. ABC affiliate and on KUSA-TV, the Denver, Colorado ABC affiliate. The Wonder Years premiered on ABC immediately following the game. This was only the second successful series to debut following a Super Bowl up to that time (The A-Team, which had premiered following Super Bowl XVII, was the first). The Wonder Years was a late switch by ABC; which had initially scheduled the two-hour premiere of China Beach for the post Super Bowl slot, but concerns about the game running long and potentially pushing the premiere episode's conclusion after midnight contributed to the program change. The NFL Films NFL's Greatest Games highlight film was titled Ambush at Super Bowl XXII; and was the first such highlight film to feature former Boston and Buffalo radio personality Jeff Kaye as its narrator. The pregame festivities featured a tribute to entertainer Bob Hope, who was approaching the age of 85. Members representing the military service branches marched out onto the field in full dress uniforms, and in unison saluted Bob Hope for his dedication to helping the troops. Trumpeter Herb Alpert performed "The Star-Spangled Banner", while Pro Football Hall of Fame wide receiver Don Hutson participated in the coin toss ceremony (the game happened to coincide with Hutson's 75th birthday). Alpert's performance was the last non-vocal performance of the National Anthem in a Super Bowl to date. The halftime show, produced by Radio City Music Hall, was titled "Something Grand" and featured performances by vocalist Chubby Checker, The Rockettes, and 88 grand pianos. Among the 44 Radio City Music Hall Rockettes, American performer Jennifer Jones made her national debut as its first African American Rockette. Checker's performance marked the first time a major artist performed during the show. Redskins guard Raleigh McKenzie covering an opponent on the Broncos during Super Bowl XXII. Super Bowl XXII started out very well for the Denver Broncos. After forcing Washington to go three-and-out, the Broncos scored on their first play from scrimmage, when quarterback John Elway threw a 56-yard touchdown pass to wide receiver Ricky Nattiel, giving Denver a 7–0 lead after just 1:57 had elapsed in the game. It was the earliest touchdown any team had ever scored in Super Bowl history to that point (the record was later broken by Jerry Rice in Super Bowl XXIX, and again by Devin Hester in Super Bowl XLI). The Broncos quickly forced Washington to punt, and once again Elway displayed his superb scrambling skills. On the second play of Denver's ensuing possession, Elway completed a 32-yard pass to wide receiver Mark Jackson. Then, he caught a 23-yard pass from halfback Steve Sewell, becoming the first quarterback ever to catch a pass in the Super Bowl (Elway had scored a touchdown on that play during opening day the previous year against the Raiders). The Redskins managed to halt Denver's drive on the 6, but kicker Rich Karlis kicked a field goal to increase the Broncos' lead to 10–0. After yet another Redskins punt, Denver managed to drive to the Washington 30 on their third possession with two runs by Gene Lang for a total of 24 yards and an 18-yard reception by Sewell. But this time they failed to score because Washington safety Alvin Walton sacked Elway for an 18-yard loss on third down, pushing the Broncos out of field goal range. Meanwhile, the Redskins could not generate any offensive momentum in the first quarter, with the Broncos' defense forcing a punt on every drive. To make matters worse, late in the period, quarterback Doug Williams twisted his back leg while planting to make a throw and had to leave the game. Williams was untouched by a Bronco defender before he dropped the ball while falling to the ground; the referee, however, inadvertently blew his whistle, stopping the play & costing Denver a fumble recovery and an almost certain fumble return touchdown and a 17-0 lead. 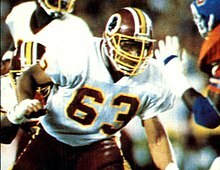 Backup quarterback Jay Schroeder was sacked by Denver's Karl Mecklenburg on his first snap, continuing the Redskins' offensive woes. By the time the quarter ended, the Broncos had more than twice as many total yards of offense (142) as the Redskins (64). In the previous 21 Super Bowls, no team had ever overcome a 10-point deficit to win. Williams returned with 14:17 left in the second quarter, and the Washington offense began to click. And much like they had in the second half of Super Bowl XXI against the New York Giants, the Broncos defense collapsed. On the Redskins' first play of the second quarter, receiver Ricky Sanders got behind defensive back Mark Haynes (who tried to jam him at the line of scrimmage) and safety Tony Lilly, caught a pass from Williams, and took it 80 yards for a touchdown. After forcing the Broncos to punt on their next possession, Washington advanced to the Denver 27. Facing third-and-one, Williams connected with receiver Gary Clark who made a diving catch in the end zone to give Washington a 14–10 lead. After the ensuing kickoff, Denver drove to the Washington 26, aided by running back Sammy Winder's 27-yard reception and Elway's 21-yard run. But left tackle Dave Studdard, blocking defensive end Dexter Manley, went down with a knee injury. After Elway threw an incomplete pass on third down, Karlis missed a 43-yard field goal attempt. On the first play of the Redskins' ensuing drive, Williams threw a 16-yard completion to Clark. Then on the next play, running back Timmy Smith, a rookie in his first NFL start, took off for a 58-yard touchdown run, with blocking from guard Raleigh McKenzie and tackle Joe Jacoby, making the score 21–10. Washington's offensive line featuring McKenzie and Jacoby figured greatly in a play known as the Counter Gap, which the Skins ran repeatedly in the game. The Redskins increased their lead to 28–10 on their next possession with a 50-yard touchdown pass from Williams to Sanders, making him the first player in Super Bowl history to catch two touchdowns in one quarter. Four plays after the ensuing kickoff, Washington defensive back Barry Wilburn intercepted a pass from Elway on the Redskins 21, and once again, the Redskins stormed down the field to score. First, Smith broke loose for a 43-yard run, then Williams completed a pair of passes to Sanders to reach the Denver 7. Two plays later, Williams threw an 8-yard touchdown pass to tight end Clint Didier to make the score 35–10. On Denver's next drive, Elway completed three consecutive passes for 40 total yards to advance to the Redskins 36. However, Washington rookie defensive back Brian Davis intercepted Elway's next pass at the 21 with seven seconds left in the half. In the second quarter alone, Williams completed 9 of 11 passes for 228 yards and four touchdowns; Smith rushed five times for 122 yards and a touchdown; and Sanders caught five passes for 168 yards and two touchdowns. The Redskins scored 35 points and gained 356 yards in total offense, both Super Bowl records, and scored five touchdowns on 18 total offensive plays. During the regular season, the Broncos had allowed 35 points for the entire game only once—and it was in that game, a 40-10 loss to the Houston Oilers in Week 4, that they fielded replacement players, with the regular players having gone on strike. Smith finished the game with a Super Bowl record 204 rushing yards, and scored two touchdowns. Sanders caught nine passes for 193 yards and two touchdowns, and returned three kickoffs for 46 yards. His 193 receiving yards and his 235 total offensive yards were both Super Bowl records, and his 80-yard touchdown reception in the second quarter also tied a Super Bowl record. Clark caught three passes for 55 yards and a touchdown, while also rushing once for 25 yards. Wilburn recorded two interceptions, while Walton had two sacks. Meanwhile, running back Gene Lang was the Broncos' leading rusher, with only 38 yards on five carries. Elway finished the game with 14 out of 38 pass completions for 257 yards, one touchdown, and three interceptions. He was also Denver's second-leading rusher with 32 yards on three carries; this was the only Super Bowl in which Elway played without scoring a rushing touchdown. Jackson was Denver's top receiver with four catches for 76 yards. The following records were set in Super Bowl XXII, according to the official NFL.com boxscore and the ProFootball reference.com game summary. † Combined yardage category includes rushing, receiving, interception returns, punt returns, kickoff returns, and fumble returns. In addition to Grier, Dale Hamer was promoted to referee in 1989. Don Wedge was a referee from 1976 to 1978 before becoming a side judge in 1979. ^ Gorman, Bill. "Historical Super Bowl Nielsen TV Ratings, 1967–2009". Tvbythenumbers.com. Retrieved November 26, 2010. ^ Garber, Greg (January 29, 2013). "Doug Williams embraces history". ESPN.com. Retrieved September 29, 2013. ^ a b "N.F.L. Approves Sale of Broncos". The New York Times. May 24, 1984. Retrieved January 11, 2010. ^ a b Forbes, Gordon (January 26, 1996). "Best lobbyists have best chance // Winning presentation doesn't guarantee winning game". USA Today. Retrieved January 11, 2010. ^ a b "REDSKINS PULL BRONC-BUSTER". January 8, 2014. ^ "One Super Show!". si.com. ^ "Super Bowl XXII boxscore". NFL.com. Retrieved November 7, 2016. ^ a b c d "Super Bowl XXII statistics". Pro Football reference.com. Retrieved November 6, 2016. ^ "Super Bowl XXII–National Football League Game Summary" (PDF). NFLGSIS.com. National Football League. January 31, 1988. Retrieved June 27, 2016.